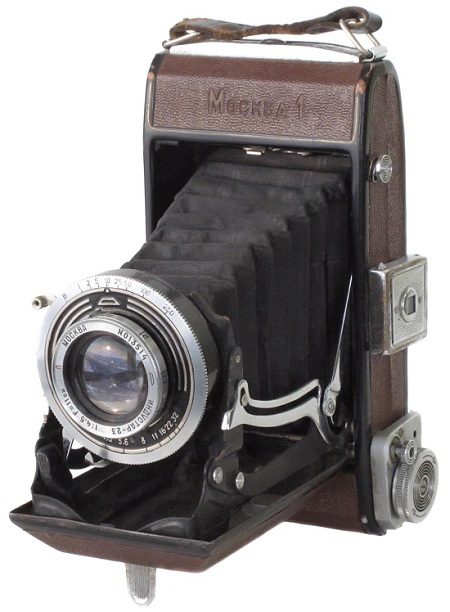 The Moskva-1 was the first Ikonta type folder made by the KMZ factory. 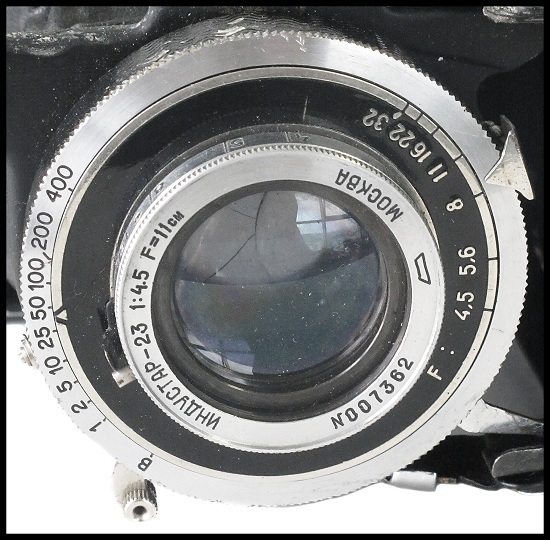 First batches of Moskva-1 were made with Zeiss parts and tools. This model was in production at the KMZ factory for only 3 years, from 1946 to 1949. 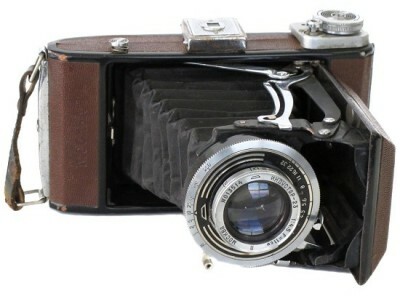 The camera uses standard 120 film and produces eight 6x9 frames. It features scale focusing, a hinged back door and a double exposure prevention mechanism. 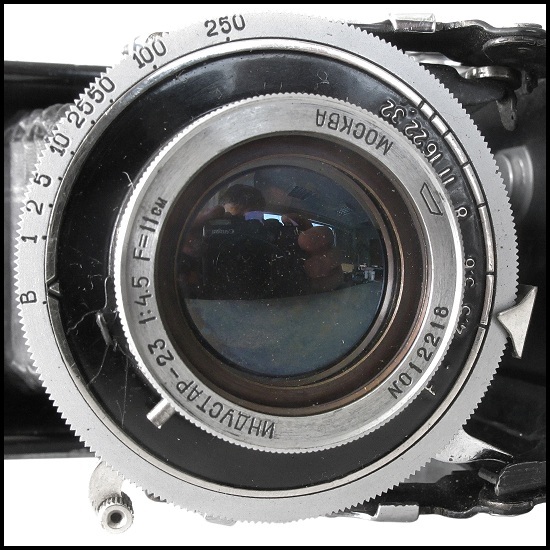 Early Moskvas used genuine Compur shutters, so it is possible that this shutter has some Zeiss parts in it. Moskva-1 is quite uncommon and hard to find now. 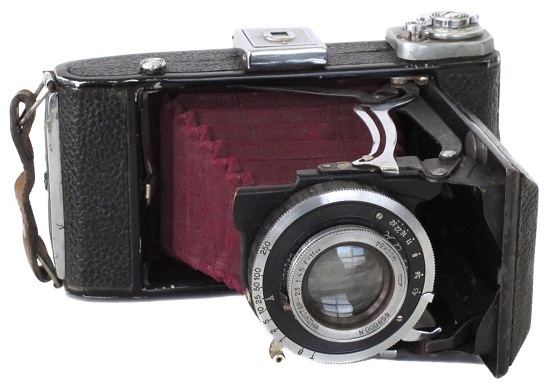 Most of the Moskva-1 were covered with black leather, and small quantities - with brown leatherette. The Moskva-1 displays old KMZ logo - a tombstone type. You can see it in the lens, shutter, and inside the back door (source: http://www.fedka.com). Shutter: 1s, 1/2s, 1/5s, 1/10s, 1/25s, 1/50s, 1/100s, 1/250s + B. 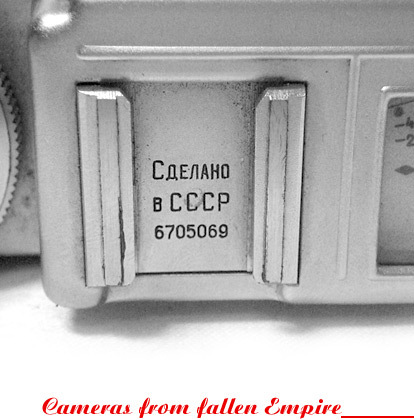 An earliest Moskva-1 camera in my collection. 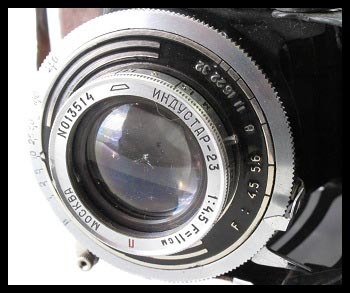 Serial number #471482, fitted with Zeiss Ikon Compur shutter with speeds: 1s, 1/2s, 1/5s, 1/10s, 1/25s, 1/50s, 1/100s, 1/250s + B (see picture below). 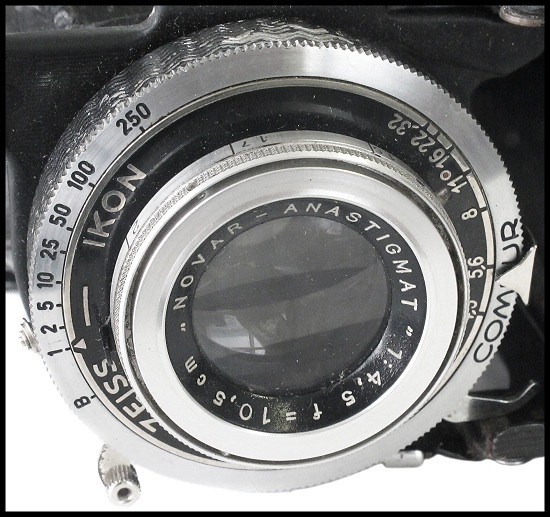 NOVAR - Anastigmat 4.5/105mm lens. 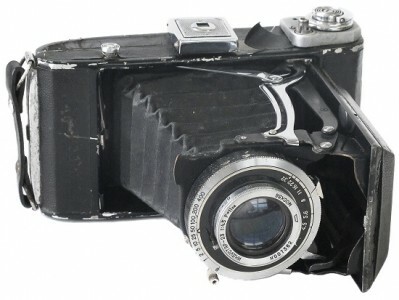 Very few cameras released in 1947. Black body coverings. Camera from Ilya Stolyar (USA) coll. 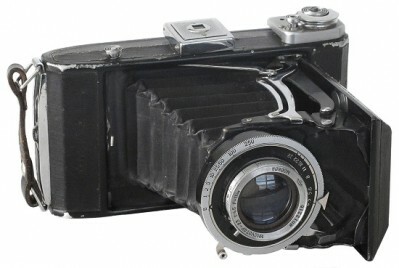 Very early and unique version of the particular camera. Compur shutter with speeds: 1s, 1/2s, 1/5s, 1/10s, 1/25s, 1/50s, 1/100s, 1/250s + B + T (see picture below). With rarest red bellows! Moskva-1 with Industar-23 4.5/110mm lens, but fitted with No Name ("Compur Rapid") shutter, speeds: 1s, 1/2s, 1/5s, 1/10s, 1/25s, 1/50s, 1/100s, 1/200s, 1/400s + B (see picture below). Camera from Ilya Stolyar (USA) coll. 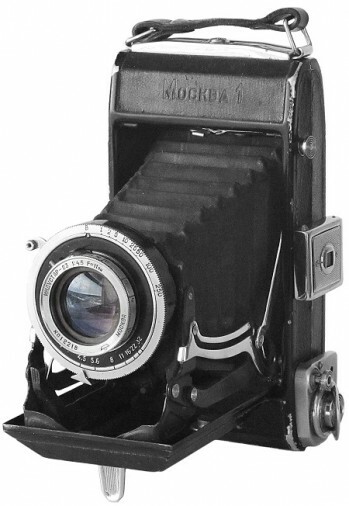 Moskva-1 with Industar-23 4.5/110mm lens, but fitted with No Name shutter, speeds: 1s, 1/2s, 1/5s, 1/10s, 1/25s, 1/50s, 1/100s, 1/250s + B (see picture below). Camera from private collection in Europe. 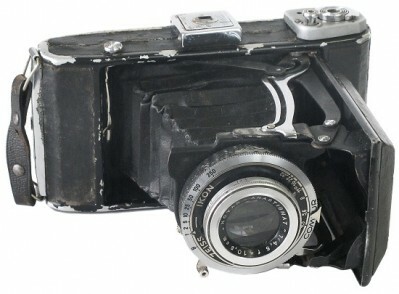 Version of Moskva-1, assembled from domestic parts only. 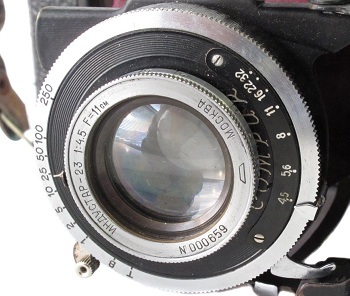 No-Name soviet shutter ("Moment-1") with speeds: 1s, 1/2s, 1/5s, 1/10s, 1/25s, 1/50s, 1/100s, 1/250s + B (see picture below). Less common to find, since covered in brown-colour leatherette. Camera from Ilya Stolyar (USA) coll.